I have been warning of some impending profit taking for over a week. The market does not need an excuse to take profits but whenever one appears traders use it as a reason. 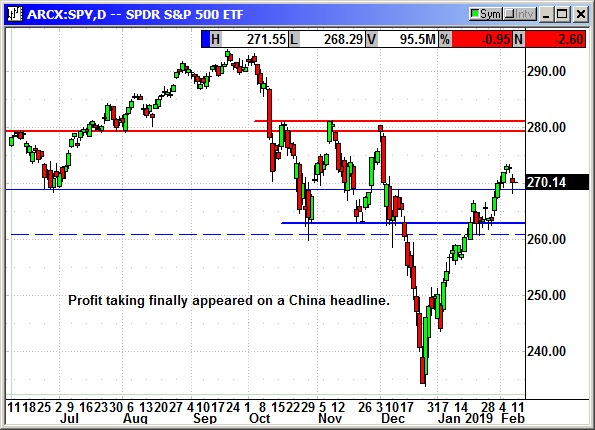 Larry Kudlow said we were still a long way from a deal with China and President Trump said there will probably not be a meeting with President Xi before the March 1st tariff deadline. European economics were downgraded again and now the Fed is not expected to hike again over the next two years. A lot changed in 24 hours and I am surprised we only closed down -220 on the Dow. It may not be over with the futures down -12 tonight. The long position was entered at the open and stopped at $159. The long position was stopped out at $108.65. The long position was stopped out at $272.15. The long position was stopped out at $126.35. Not a good day to enter a new play on a tech stock. No specific news but shares fell $4 with the market to stop us out. F5 Networks, Inc. develops, markets, and sells application delivery networking products that optimize the security, performance, and availability of network applications, servers, and storage systems. The company's primary application delivery technology is Traffic Management Operating System (TMOS) that enable company's products to intercept, inspect, and act on the contents of traffic from virtually each type of Internet Protocol-enabled application. It offers Local Traffic Manager, which provides intelligent load-balancing, traffic management, and application health checking; BIG-IP DNS that automatically directs users to the closest or best-performing physical, virtual, or cloud environment; Advanced Firewall Manager, a network firewall; and Application Security Manager, an Web application firewall that provides comprehensive, proactive, and application-layer protection against generalized and targeted attacks. The company also provides Access Policy Manager, which provides secure, granular, and context-aware access to networks and applications; Carrier-Grade Network Address Translation, which offers a set of tools that enables service providers to migrate to IPv6 while continuing to support and interoperate with existing IPv4 devices and content; and Policy Enforcement Manager that offers traffic classification capabilities to identify the specific applications and services to service providers, as well as Link Controller. In addition, it offers cloud-based and other subscription services; BIG-IP appliances; VIPRION chassis-based systems; BIG-IP Virtual Edition software platform; and management and orchestration software platform. The company sells its products to enterprise customers and service providers through distributors, value-added resellers, and systems integrators in the Americas, Europe, the Middle East, Africa, Japan, and the Asia Pacific Region. F5 Networks, Inc. was founded in 1996 and is headquartered in Seattle, Washington. Company description from FinViz.com. On January 24th, F5 reported earnings of $2.70 that rose 19.5% and beat estimates for $2.54. Revenue of $544 million rose 4% but narrowly missed estimated for $547 million. Software sales rose 21% and contributed 19% to total revenues. Services revenues rose 4.7% to $309.9 million and accounted for 57% of the total. EMEA revenues rose 7% and Asia Pacific/Japan rose 11%. Enterprise customers accounted for 65% of revenue, services providers 14% and governments 21%. Gross margins were a whopping 85.2% with operating margins of 37%. They ended the quarter with $1.13 billion in cash and long-term debt of $435 million. 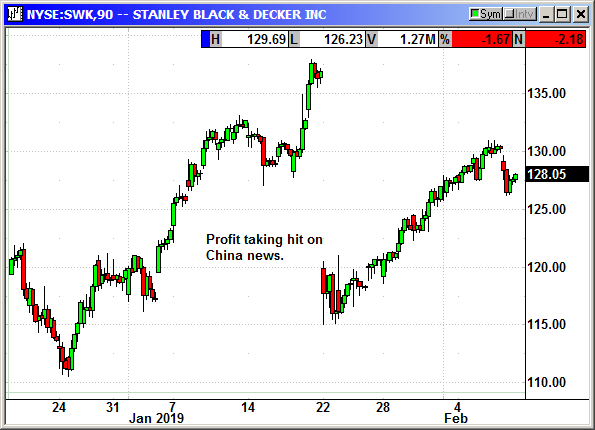 They repurchased $101 million in shares in Q4 and authorized a new $1 billion buyback for 2019. F5 is going through a product transition from providing a physical piece of hardware that acts as a firewall for customer servers, to a software as a service model where they supply a software firewall and eliminate the hardware expense. This impacts revenue because the hardware is expensive. As hardware is eliminated from the sales cycle it drags on total revenue but margins gain appreciably. They are launching F5-as-a-Service and Cloud Native App Services in the first half of 2019 and should be key growth drivers. They guided for software revenue growth of 30-35% in 2019-2020. Earnings guidance for Q1 was $2.53-$2.56 with revenue of $543-$553 million. Shares dipped to $152 after earnings and then flatlined for a week. Over the last week shares have been rising. With most stocks already rebounding 15-20% since December, fund managers and investors should be looking for these fallen stars as a less risky investment. Closed 2/7: Long March $170 call @ $2.75, exit $1.47, -1.14 loss. No specific news. 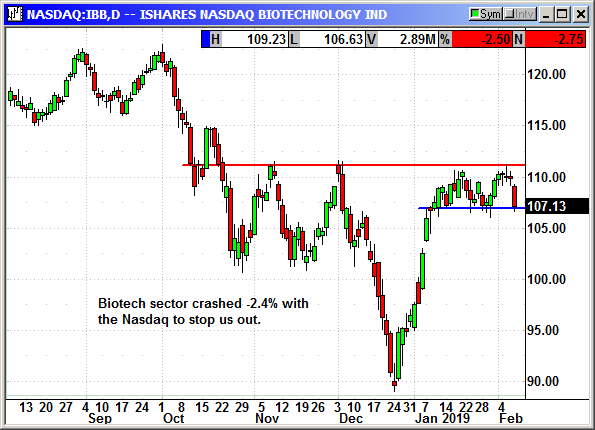 The biotech sector crashed -2.4% with the Nasdaq to stop us out. Closed 2/7: Long March $115 Call @ $1.79, exit .55, -1.24 loss. 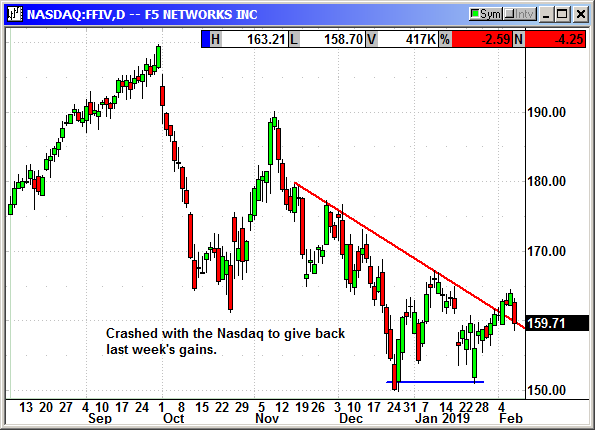 The morning market crash hit our tight stop on this February position to stop us out for a nice gain. 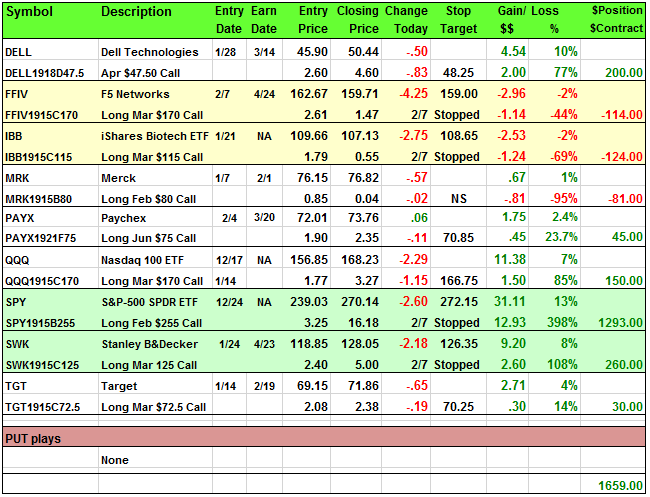 Closed 2/7: Long Feb $255 Call @ $3.25, exit $16.18, +12.93 gain. No specific news. 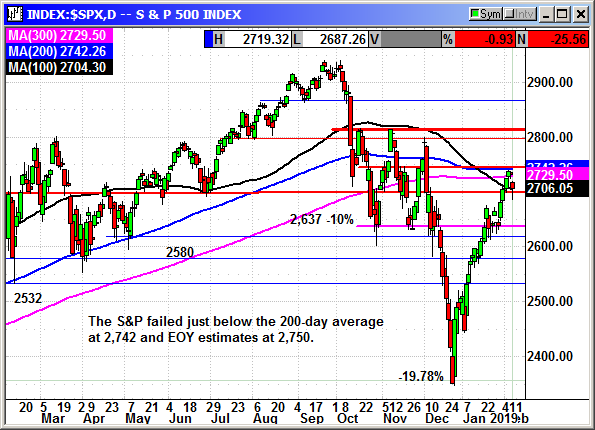 The market sell off today simply triggered profit taking and the three weeks of gains saw some retracement. If we get another down day on Friday, I am going to reenter this position on Monday. Update 1/30: OpenGate Capital has agreed to buy lock maker Sargent and Greenleaf from SWK. The lock maker was founded in 1857 and sells products in more than 100 countries. No terms were disclosed and the transaction will be completed in March. Closed 2/7: Long Mar $125 Call @ $2.40, exit $5.00, +$2.60 gain .